New Brooklyn historic district brings another 600 buildings bordering original Park Slope Historic District under Landmarks jurisdiction. 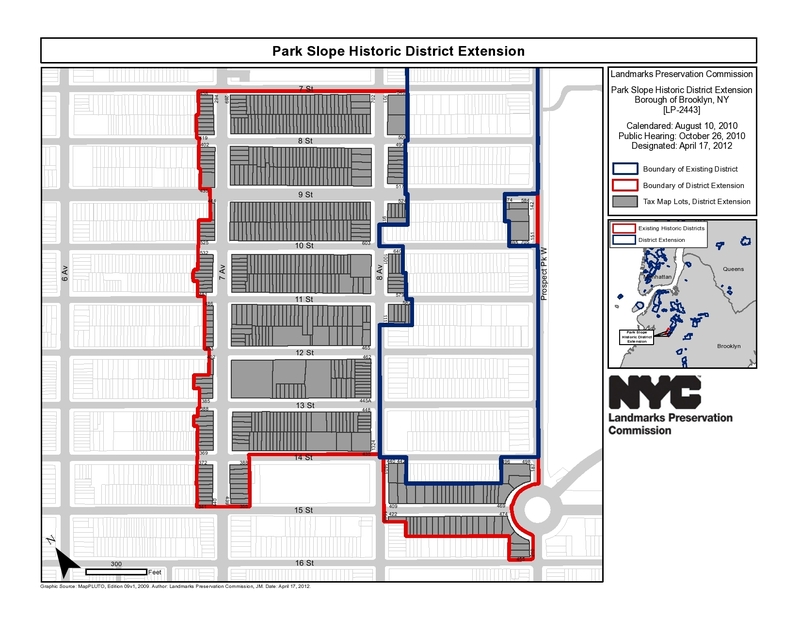 On April 17, 2012, Landmarks unanimously approved the creation of the Park Slope Historic District Extension. The extension includes 600 buildings on the southwest border of the 1973-designated Park Slope Historic District. The new district is generally bounded by 7th Street to the north, 15th Street to the south, 8th Avenue to the east, and 7th Avenue to the west. It also includes buildings on 15th Street between Prospect Park West and 8th Avenue lining the northwest side of Bartel-Pritchard Square, as well as a group of buildings facing Prospect Park West between 9th and 10th Streets that were not part of the original Park Slope Historic District. The extension features rowhouses and apartment buildings representing a variety of architectural styles. According to Landmarks, the earliest row of homes in the district was built between 1869 and 1875 in the ornate Italianate style. More than 200 of the district’s rowhouses were built in the simpler Neo-Grec style. (A guide on rowhouse styles prepared by Landmarks can be found here). Other notable structures in the district include the 1879 Ansonia Clock Factory on 7th Avenue, and the 1880s, red-brick, Ladder Company 122 building on 11th Street. At a public hearing in October 2010, local elected officials, residents, and preservationists supported designation. The lone dissenter was the owner of a rowhouse on 7th Street who argued that creating the district would ensure that the middle class would be unable to buy homes in the neighborhood. (Read CityLand’s past coverage here). When Landmarks convened in April 2012, the commissioners unanimously approved designating the district extension. Commissioner Fred Bland said Park Slope was one of the most cohesive parts of the City, and he questioned why the buildings had not been included in the original district. Commissioner Michael Devonshire, who resides within the district, was “turning inside out with joy,” that there would now be protection from the “architectural Miracle Whip” he has seen fill several vacant lots in the neighborhood in the past few years. LPC: Park Slope Historic District Extension, Brooklyn (LP-2443) (April 17, 2012).